We explore climate change, and then we look at what enthusiasts have done to push out the edges of the technological envelope from a 2004 perspective. I remember listening to a radio show on PRI (Public Radio International) where a scientist was viewing data that came from a satellite that measured heat conditions across the surface of the Earth. He did some calculations and found that there were noticeable differences in surface temperatures in areas of the globe that were industrialized. Another scientist was surprised on the air to discover that the human heating systems had a measurable effect on the overall temperature of the planet. Prior to seeing the data he had believed that heating systems had no measurable influence on the temperature of the earth’s atmosphere. My witness of this discovery made me realize some time ago that man’s activities affect the temperature of the planet. Venice, Italy was thought to be sinking into the sea. A city that was built in Roman times and stayed the same for more than two millennia was suddenly too low in the water to walk the streets at high tide. Venice, we now know, is not sinking. The oceans are rising. What is causing the rise? An increase in greenhouse gasses is causing the rise. The gasses that keep the heat in near the planets surface are growing at a great rate, which doesn’t allow for the temperatures achieved during the day to be dissipated into space at night. Whose is Producing Pollution? Cars? Farms? Factories? As people drive more cars the gains made in reducing emissions for a single car can be erased by the increased number of users, which is what has happened in California. The only solution to California’s smog problem and the United States dependency on foreign oil is to find alternatives that do not pollute as well as allow consumers to choose a vehicle that suits their needs and tastes. Nothing in this world has ever brought technologists and gear heads so close together than the idea of building the most sophisticated automotive technology needed to make a solar car. The Mecca of solar car test racing is the World Solar Challenge. Hans Thostrup was a person who believed that the spirit of competition would push the edge of technology further forward. I don’t believe he foresaw the influence his event would have on technology as a whole. At first only a few universities entered the competition. The World Solar Challenge’s (WSC) first year was the bastion of large corporations, some local Australian universities and the Engineering College of Biel, Switzerland who had also participated. The surprise of the event was that the local universities did so well against world class corporate giants. The instant prestige that the event gave to Australian universities and to Biel pushed other universities around the globe into the fray. In a few short years the large corporate representation that was present at the beginning gave way to universities dominating the WSC. Lately, the Australian universities, who have been an ever present force in the competition, have regrouped and formed teams made up of several universities. These groups call themselves associations. The best example of this is the Aurora Vehicle Association that won the event in 1999. High school associations have also entered the event and in the early years one such high school group placed near the top, of course it was the United High Schools of Beil, Switzerland association. 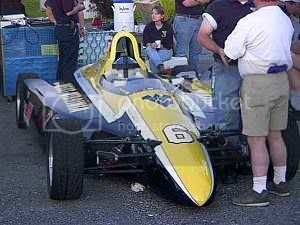 The Formula Lightning competitions are based on making the motors and drive train fast and efficient. The cars themselves follow a strict standard to keep costs low and participation high. Though the excitement is high among participating engineering schools, the high degree of standardization has not brought about much innovation. Yet, to see Formula-1 type cars speeding around a race track at speeds of 140 miles per hour certainly does dispel any idea that electric cars are slow and dull. It also demonstrates how schools, when they compete with each other, are virtual hotbeds of innovation. Colleges and universities are not the only ones who have been sparked by competition. High schools, elementary schools and others are all getting into the act. Teachers looking for ways to spark student’s interest have found that competition and project building are very effective ways to demonstrate a direct connection between real life and what is learned in the classroom. Though started in England electric vehicle endurance runs were the fathers to such contests as the World Solar Challenge and Tour de Sol. 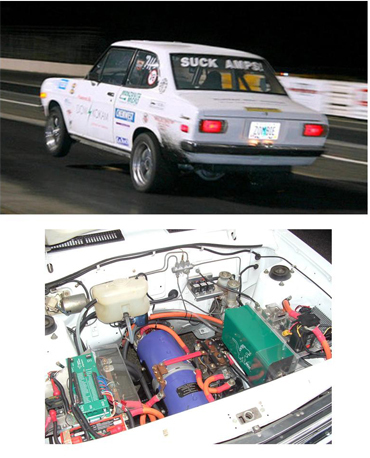 Both contests grew out of electric vehicle endurance races. Today they are a rage among elementary schools in Canada, Australia and in the Northwestern states of the United States. The idea of taking thousands of dollars of ones hard earned money and thousands of hours of a persons precious time plus the cost of a car that you gut of the engine, gas tank and anything else associated with an internal combustion engine just to make a car run on electricity would indicate to me that there are some people in the market that really, really want electric cars. Now think that there are enough people doing this that an entire industry has grown up around them to supply these people with all they need to do just that, to convert standard cars to electric power. There are literally thousands of electric conversion vehicles on the road; there are probably just as many attempts at converting vehicles to electricity that are unfinished in people’s garages. How do I know this? I know this because in my research I came across web site after web site of classified ads for these vehicles. I found them on eBay. I found parts distributors, parts manufactures and much more. There were companies that specialized in making electric motors for conversions, transmission adapters, motor controllers, switches, gauges, brake compressors, etc. You name it there is a company that has it. There are books on how to do conversions. I bought, "Build Your Own Electric Vehicle," by Bob Brant. There are web sites that display pictorials and diaries of the trials and tribulations of converting a vehicle to electricity. I did a search on Google narrowing the search to "electric vehicle conversion" or "electric car conversion" and I got 3,110 relevant sites. This enthusiasm for electric vehicles convinced me that there is a bigger market for electric vehicles than the major automakers in Detroit would like us to believe. 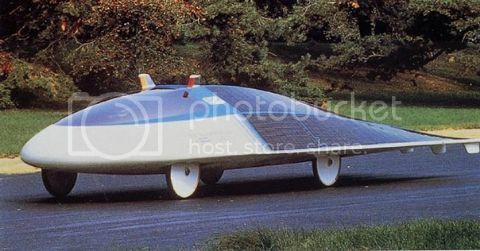 If you want to see an example of what I am talking about go to The Electric Vehicle Photo Album at http://www.evalbum.com/. There you will find many examples of electric conversions as well as parts, and some production vehicles too. Conversions were one thing but hand built vehicles were quite another. There are various backyard tinker built vehicles made of bicycle parts and other objects found around the house. One vehicle grabbed my attention more than all the rest. It was the Robert Q. Riley designed Trimuter, a space ship looking three wheeled vehicle that appeared on the cover of Mechanix Illustrated magazine in February, 1980. The designer’s idea was that an enthusiastic person with a little dexterity, time, tools, money and a garage could purchase plans and build the car from scratch. From the looks of it many people did just that because I have seen these vehicles completely built come up for sale from time to time on EBay and elsewhere. The plans are still available for purchase on Robert Q. Riley’s web site. Go to http://www.rqriley.com/tm.html. The Trimuter just looks out of this world. I found clubs for steam powered cars, solar powered and hybrid vehicles as well. I did not find clubs or associations for compressed natural gas, (CNG), liquefied natural gas, (LNG), hydrogen, methanol, ethanol or compressed air vehicles. By far the most enthusiasm shown for any type of alternative fueled vehicle, gauged by the number of clubs and associations formed to support ownership, was the electric vehicle. Alternative forms of personal propulsion have a strong appeal to many people. Not just because it may save the planet from the effects of oil waste. I believe what really motivates people to put such extraordinary efforts in acquiring, converting or hand building electric cars, and for schools the desire to design and build vehicles that push to the outer edges of capacity and efficiency, is that there is a genuine belief that alternative vehicles are the future. The largest group of forward looking individuals believes that the future, in some way, shape or form, is electric. EV World commentator since 2005. Mr. Lado was a former board member of the Electric Automobile Association (EAA).